Game Mode is only just getting started, but the feature has potential. I'm old enough to remember the days of DOS gaming, and in particular I remember creating special 'clean boot' floppy disks that would bypass loading a bunch of extra drivers and utilities that consumed precious amounts of my 640k base memory. I probably know more about hacking and editing config.sys and autoexec.bat files than anyone sane. Things took a turn for the better around MS-DOS 5.0, but when DOS gaming finally bit the dust and things transitioned to Windows (which really didn't get going until well after the launch of Windows 95), I didn't shed a single tear for my now obsolete boot disk hacking skills. Because Windows and other modern operating systems have more memory and full preemptive multitasking, sometimes it feels like we don't need to worry about what else might be running in the background. And if I'm being honest, as long as you're not doing anything too strenuous—and you're not infected with malware—on a good gaming PC it probably doesn't matter too much. I turn off the firewall and anti-virus on my test PCs, and tweak a few other items just to be sure, but with four cores, 16GB RAM, and a large SSD for your files, your system should run games quite well. But what happens when you have a PC that's not running lean and clean and you fire up a game? Potentially, you have all sorts of background applications running, sucking down precious resources. What if there were a way to effectively have Windows itself tell all of these other processes to pipe down? That's sort of the idea of Game Mode. It sounds promising, though our initial results highlight the early nature of the software and the need for iteration and additional testing. Given everything involved with testing gaming performance, the idea of Game Mode is a huge can of worms. What's the baseline, and how do we ensure a repeatable and reliable testing environment? Normally, I keep my test systems clean from any unnecessary software and utilities—things like Java, Skype, AV suites, or anything else likely to introduce variability. Game Mode on the other hand is theoretically at its best when all of those extras are present, since they can potentially create slowdowns. The difficulty comes in finding a way to introduce a consistent workload on a system. Game Mode is in early beta, and Microsoft told us that they're still looking at the feature and a variety of ways to make it better. That means all the testing I've done so far probably won't even be representative of what Game Mode offers in six months. Which is good, because the feature needs work right now, but bad because it means early testing is just that: early. For this first round I opted to ignore the potential for Game Mode to help more when a system is running 'dirty' and instead see if it can improve performance even when there's not a bunch of extra junk in the way. I did fire up a few utilities just to produce a bit of extra load, specifically, I ran MSI Afterburner and left the monitoring tab open, and I ran Task Manager and left that up. Both of these utilities put a very small load (maybe a few percent at most) on the system, but at least they're a consistent load. The test hardware consists of a shiny-new Kaby Lake testbed, which you can see in the boxout. I ran extensive testing with the GTX 1080 FE, and after gathering results from five games I then spot-checked a few of the games with two other GPUs. All parts were running stock, so no factory overclocks of the CPU or GPU. The reasons for the limited testing will become apparent as soon as you see the charts. Finally, since I wanted to really get a good idea of whether Game Mode is helping or I'm just seeing minor variations between runs, I tested each game five times and averaged the results after checking for outliers. That makes the figures I'm reporting more statistically significant than if I were to only run each card once, though it doesn't make the results practically significant. Starting with the Core i7-7700K, it shows no benefit to Game Mode in the games I tested, with four showing equal to slightly lower performance (0-1 percent slower with Game Mode on), and one game, Hitman, showing a clear drop (four percent lower average, and 10 percent lower minimum fps). Hitman is a bit of a surprise, since it tends to be one of the few games that shows much in the way of scaling with CPU performance. I actually expected it to be a case where Game Mode would help, but clearly that didn't happen. Of the other four games, The Division does show slightly better minimum fps, but everything else is a wash or slightly worse. Swapping out the CPU for a slightly lower clocked dual-core i3-7350K, Game Mode doesn't look quite so bad… or maybe it does. Two of the games, Ashes of the Singularity and GTAV, now show a minor 1-3 percent increase in both average and minimum fps. The other three all show a drop, though in the case of The Division it's negligible (0-1 percent). 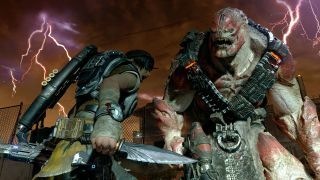 Gears of War 4 is now down 1-3 percent, and Hitman goes from bad to worse, showing an even larger 11-14 percent drop in performance. I checked the R9 Fury and GTX 1050 Ti as well and the story is much the same. I didn't find any situations with either GPU using an i7-7700K where Game Mode provided a meaningful improvement, and the 1050 Ti in particular appears to be the bottleneck in nearly all cases. Even with a slower CPU, Game Mode didn't provide any benefit with the GTX 1050 Ti. There are situations like Hitman where Game Mode is clearly getting in the way, but everywhere else the change in performance isn't particularly noteworthy. In general, pairing a slower CPU with a faster GPU seems to be the best-case scenario for Game Mode helping right now. One thing you also need to be aware of with Game Mode is that it requires using the Windows Insider preview builds. I wrote about the pitfalls of Windows 10 Insider Preview last year, particularly highlighting the issues I encountered with the 'fast ring.' There are currently three options for Insider Preview: Fast, Slow, and Release Preview. A better way to think about these would be alpha (or early beta), beta, and release candidate. While the slow and release builds are generally safe, the fast ring is deep in the realm of untamed bugs and potentially broken functionality. And if you want to try Game Mode right now, the only way you can do that is via the Fast Ring. I didn't notice too many major issues with build 15019, though it isn't on my daily driver for the reasons mentioned above, but the one problem that did come up is some games have 'known issues.' One of the issues is that certain games end up minimized and can't be restored. This happened with The Witcher 3, so I couldn't test performance at all. Many other games would minimize (or at least lose focus) and I would then need to alt+tab back to the game. It's mildly annoying, and one more reason to not jump on the Insider builds. There's the other side of the story to the Fast Ring, though. If you like living on the bleeding edge, Microsoft drops regular updates, sometimes on a weekly basis. So after my initial testing with 15019, 15025 comes out and fixes a few things, including the 'minimizing games' problem. My experience is that some Fast Ring builds are fine, others have major issues. If you want to see what Microsoft is up to before the features are fully baked, it's an interesting new approach from Redmond. If you only have one PC, however, I'd stay away from the Windows Insider builds—they're much better as something you use on a second system, in case things go awry. The Gaming Bar would benefit from a keyboard shortcut to enable/disable Game Mode. If the results I've seen so far are disappointing, keep in mind where I started: a clean OS install that's not running a bunch of junk, using mostly high-end hardware. Unfortunately, doing further testing and analysis of Game Mode right now doesn't feel like a good use of time. The software is still in the early development stages, and the only way to even get it is via the Windows Insider Fast Ring. Perhaps when the Windows 10 Creators Update is finally released to the public, there will be enough changes to make Game Mode more meaningful, and I'll look at it again then. For anyone running a less pristine OS install, with all sorts of extra drivers and utilities, Game Mode also has the potential to be more beneficial. I did play around briefly with trying to put a secondary load on the GPU while gaming, but the results were so bad (30 fps in Gears 4, with or without Game Mode) that I stopped. Running a moderate CPU load (Cinebench using 1/2/4/6 threads) while gaming didn't show much of a difference either, which is a bit odd. It seems the default Windows scheduling priority already does a fairly good job at keeping games running well. Or maybe Game Mode in its present state is missing most of the intended functionality. My impression is that Game Mode may be more useful on older/slower PCs, or in situations where the CPU becomes more of a bottleneck. It's not too hard to see why that's the case. Most gamers I know like to keep their PCs relatively free of junk software, as it can get in the way and slow things down, causing periodic dips in performance. If you're playing a game and Windows Update decides to start downloading files, for example, that can use up both CPU and networking resources. With an extreme gaming PC sporting a 6-core or 8-core processor, the CPU isn't likely to be a bottleneck unless you're intentionally running extra processes (like encoding a video or streaming using the CPU while gaming), but if you only have 2-4 CPU cores available, sometimes just keeping the base Windows services running can take away a few fps. On the graphics card side of things, I don't see nearly as much potential for Game Mode to help out. If you happen to run a heavy GPU computing application while gaming, it could shift more resources to the game and away from the other computations, but as Microsoft stated in our interview, it's a zero-sum game. Meaning, Game Mode won't magically give you more resources than what you already have—it simply tries to rebalance the priority levels in favor of games. I'm not sure I know anyone that tries to play games while running Folding@Home on their GPU at the same time. Such people probably exist, but it's usually far easier (and beneficial) to kill off the GPGPU programs while gaming and start them up when you're done. The biggest hurdle with Game Mode is likely to be profiling of a large selection of games on a variety of hardware configurations. Long-term, as Microsoft gathers more data on individual games and multiple hardware configurations, it will hopefully be able to tweak the default allocation of resources on a per-game basis. So if Hitman really needs as many physical CPU cores as it can get, whereas a game like Arma 3 might only need two cores, Game Mode would behave differently for each title. Given the number of games and the nearly infinite variety of hardware configurations available, this might look like an insurmountable task, but the mere presence of Game Mode opens doors for hardware vendors to work more with Microsoft to optimize performance. Long term, I wouldn't be surprised to see Game Mode become something that AMD and Nvidia tie into with ReLive and GeForce Experience as yet another element of optimizing performance for your specific PC. In the meantime, shutting off unnecessary utilities lurking in your system tray (and doing a period malware scan) should give you most of what Game Mode has to offer.